Photo by Karen Resta I rushed to get dressed appropriately for a visit to Times Square (I’ll leave it to your imagination), grabbed my subway card and headed out. It wasn’t long before I hit the streets, and there was no question I was headed to the right place. Photo by Karen Resta At the entrance to Ripley’s, Chester Cheetah was there to welcome us. He was every bit as cool in real life as he looked on the front of the Cheetos packages, but this time, he had a small cat in his hand. It was a cat made out of Flamin’ Hot Cheetos. Photo by Karen Resta One of the staff told me last year’s winning Cheeto had been in the shape of a cat, which was very inspiring. Here’s a close up of the cat (this wasn’t the actual Cheeto piece winner, but just a larger copy of the winner so we’d know what we would be up against in this contest). Photo by Karen Resta At the top of a flight of stairs is the entrance to the Cheetos Museum. The door opens and suddenly we’re in a room whose walls are entirely lined with Cheetos. This is where the art is exhibited, and because of the danger of people coming in and trying to eat the walls, there’s a guard posted who is ready to protect these Cheetos with her life if necessary. She’s also full of Cheetos knowledge and lore, and will share it with you if you ask nicely. Photo by Karen Resta This is where the art is housed - the mirror-lined infinity room. Inside are the best of the best of Cheetos that all resemble something. There are animals, vegetables, even pieces of clothing, all of them in the form of Cheetos someone found! Honestly, I had anticipated the mirror-lined infinity room would be something I could walk though, but unless I had turned myself into a Cheeto myself, that would be impossible because I’m too big to fit into a glass case. Photo by Karen Resta Here’s a flamingo. Incredible!!! Photo by Karen Resta Another life-size Chester Cheetah is also in the museum room. I was slightly worried about him because it looked like he had burn marks, which I finally identified as being a quite adept shading method used in the artistry that brought him to life. Photo by Karen Resta Here’s a close up of Chester’s tail showing the method used to create the realistic look of cheetah fur, no matter how very yellow-orange it may be. So cute, that marking on the tip of his tail! Photo by Karen Resta Chester’s shoes are filled with more Cheetos, and doesn’t that red Cheeto look like another cat?! I’m not sure what those fallen Cheetos are, under his behind, but as any cat-owner knows, accidents can happen. I won’t hold it against him. Photo by Karen Resta After having finished visiting The Cheetos Museum - and imagining what shape Cheeto I might find that will win me cash prizes - the rest of Ripley’s is here to visit. On the way out, you have to pass through this tunnel that has a bridge which moves around sideways in a completely dark room of swirling lights. This is a just about perfect finish to this trip. Photo by Karen Resta Exit to Times Square - what a trip! For some reason, I’m starving. It happened right after walking over the bridge in that swirling tunnel of doom thing. Photo by Karen Resta I hit my local bodega on the way home and bought four packages of Cheetos. Now I’ve got to get to work. I need money, Cheetos, power and fame - and just look at the potential here! Right in the front near the bottom there’s a Cheeto that looks like a side view of a little Dutch girl carrying a candle, can you see it? I also see a hash pipe on the right and that one on the left looks like the perfect broken piece of fresh ginger. I got this! Photo by Karen Resta Here are my submissions. As you see, there’s a submarine, the letter Y, a seahorse, a goldfish, a clay pipe (or it might be a wooden spoon, not sure yet), and Olympic torch, a running cat (really, just look more closely and blur your eyes a bit) and a paw from some unknown species. 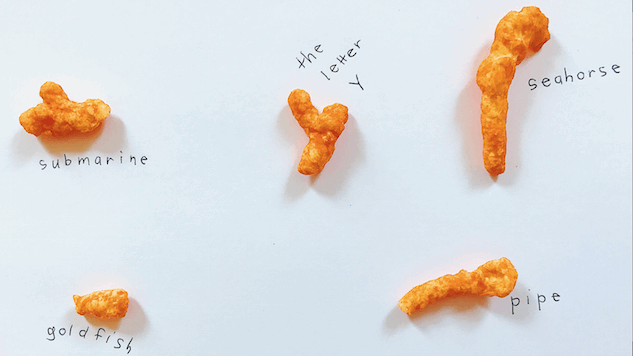 For those who can’t visit the exhibit, there’s a contest being held at the online Cheetos Museum where fans can submit their most creative shapes from both the Cheesy and Flamin’ Hot varieties with prizes worth $150,000 up for grabs, with $50,000 going to the Grand Prize Winner.” I planned to go the very next day. There was no time to waste. As for me, I’m going to plan a party because I bought way too many Cheetos to eat by myself. And I’ll give out gift bags of Cheetos, too, because if I don’t win the prize, it would be really great if one of my friends does. The call for submissions will be twice as fun – or some would say HOT – as Cheesy and Flamin’ Hot fans submit unique finds in each category. From May 29 through August 6, fans can simply submit a photo and the story of their one-of-a-kind Cheetos shape at www.CheetosMuseum.com or submit through Instagram, @cheetos, and Twitter, @ChesterCheetah, using #CheetosMuseum #Contest. Submissions will be judged weekly based on the creativity of the Cheetos shape description, and how closely the shape resembles that description. Two weekly winners, one Cheesy and one Flamin’ Hot, will be awarded $5,000 each, totaling $100,000 in prize money awarded. In August, the Cheetos brand will then turn the voting over to the public to determine the grand prize winning shape. Fans will choose which makes the better Cheetos masterpiece – Flamin’ Hot or Cheesy – when the top Flamin’ Hot shape and the top Cheesy shape go head-to-head”. The owner of the Cheetos shape with the most votes will receive an additional $50,000 grand prize and have his or her shape displayed as a part of the famous Ripley’s Believe It or Not! Odditorium’s collection – earning a place in artistic history. Karen Resta is a writer, a food culturalist, and a sometimes-fashionista who mostly loves ice cream and Brooklyn.